The recruitment industry is a huge sector in the UK, employing many thousands of people. Recruitment agencies work with companies to find appropriate people for their roles, and help individuals find their next job. Some agencies specialise in a single industry such as healthcare or manufacturing, whereas others cover a much broader market, working with any local companies they can find. As a generalist recruiter you work with candidates with a large variety of career backgrounds and also with clients from a wide range of industries, whose requirements can be anything from entry level to managerial jobs. To understand a client’s requirements it is necessary to learn about the company, the job role, the industry and the skills they need, which makes it a very interesting job. However, the knowledge you gain of a particular industry tends to be superficial, as once you have placed a candidate you will potentially move onto a different client who belongs to a different sector, meaning you will need to start the learning process all over again. You’ll never fully understand their needs in detail and will likely not be working with highly-paid specialists – you will find these all deal directly with specialist recruitment agencies. 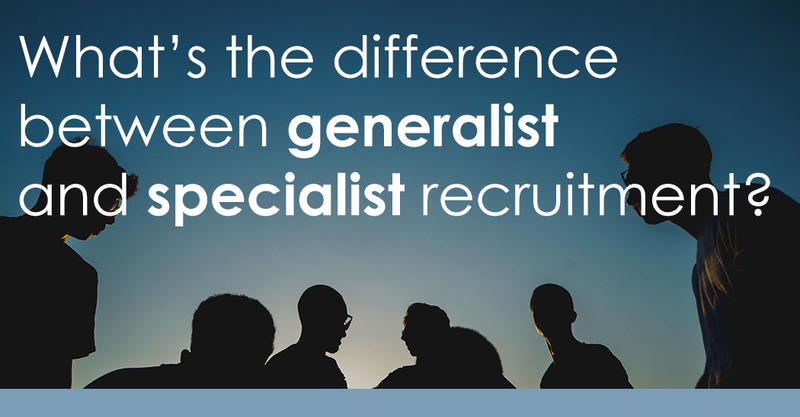 Generalist recruiters register candidates from all backgrounds and experience levels. Looking for the right candidate for a particular job can be therefore a challenging and time-consuming task, as you have to look through a large pool of varied CVs that cover an extensive list of skills and experience, which are not always relevant to the position you are looking to cover. Specialist recruitment agencies focus in certain industry, skill set or location and therefore work in a niche market. Whitehall Resources, for example, is a specialist recruitment agency who provides software system experts in SAP, Oracle and IT. These areas are further broken down in vertical markets within the business, such as permanent and contract recruitment for each category, and also per country. As a specialist recruiter, you become an expert in the industry you work in. Your clients could still be from different sectors, but the candidates you work with would belong to a specific industry or have a specific skill set. This means you work with a more focused pool of candidates with key characteristics your clients would be looking for. As a specialist recruiter, you connect with candidates and clients at a more in-depth level due to the knowledge you have about the industry, becoming an expert in what you do, enabling you to build stronger business relationships and becoming an advisor to your clients. In contrast with generalist recruitment, specialist recruiters also manage their own clients throughout the whole recruitment process, especially when the role is as a 360° recruiter, in which you will also be searching for new clients, who then become part of your own client portfolio. Specialist recruitment agencies build relationships with candidates with niche skills, therefore companies looking for specific skillsets benefit from the niche pool of candidates a specialist can offer. They also get expert advice, which can be particularly helpful when the clients themselves aren’t in the industry. This would be for example, if a warehousing company requires an IT manager, they might not necessarily know how to interview or test the IT knowledge of a candidate, while the specialist recruiter would know exactly the skills and expertise the client requires for the role and can therefore advise them in that respect. They also gain access to what’s going on in market as the recruiter will speak with hundreds of people in a single month. They’ll be aware of projects that companies are working on, places where people might be moving to and from, and where the best people are currently working. Why should you choose to be a specialist recruiter? You manage your own desk and your own clients. You actively seek new business and expand your client portfolio and enjoy the financial rewards as a result of your hard work. You become an expert and an adviser. Clients and candidates know you are the person to go to, that they can benefit from your experience and knowledge, and that you are able to deliver the results they need. You build strong relationships with candidates in your industry. Candidates trust you and become familiar with you, they contact you when looking for a job and can give you useful information about the industry and ongoing projects or company changes. If you work with highly-experienced candidates in a specialist agency like Whitehall, your commission is a percentage of a contract of high value, which consequently means you have higher earnings. Interested in becoming a specialist recruiter? We are hiring! See our current available jobs.